With all the restrictions on fragrance materials and perfume house budgets, a lot of us fear for classic chypres. Aftelier Bergamoss is proof that the chypre as François Coty conceived of it lives on. Mandy Aftel created Bergamoss with top notes including bergamot and wild sweet orange; heart notes of peach, citronellol and nutmeg absolute; and a base of oakmoss, flouve absolute, coumarin and antique civet. For me, Bergamoss tags all the bases of a beautifully made chypre and slides in for a home run with its seamless construction. Because there’s little I like more than abusing a metaphor, let’s examine Bergamoss’s progress as it scores. Prepare your Cracker Jacks. At bat: Bergamoss is a retro greenish yellow that would look terrific in velvet on a redhead. Its texture is powder-smooth and just thick enough to firmly hold its shape yet melt on skin. It leaves a moist but not greasy texture, even after several layers. First base: The “berga” part of Bergamoss comes in loud and clear, but a hint of orange keeps it from smelling like a pot of Earl Grey. The citrus is somehow both potent and silky. Thanks to the moss already peeking through, Bergamoss is immediately recognizable as a classic chypre. Second base: If you slather on enough Bergamoss, its peach and nutmeg come to the fore, but I wouldn’t call Bergamoss a fruity chypre at all. The peach adds body and pulchritude, but it’s more like peach skin than sticky pulp, and somehow Aftel has extended the fragrance’s citrus tang into its heart. The nutmeg here seems to play the same role a pinch of nutmeg does in an egg dish. It casts an earthy shadow without calling attention to itself. And moss moss moss plus the sweet dried hay of coumarin keep Bergamoss’s wet-dry, warm-cool balance perfectly pitched. Third base: An hour into wear, Bergamoss’s tanginess persists, and although I’d never call the perfume sweet, it’s now off-dry. I can’t detect the civet at all, and the nutmeg becomes more noticeable. After two hours, the fragrance is fading fast. I have to fasten my wrist to my nose to smell it. Home: Bergamoss isn’t wildly original or edgy. It's a pure chypre that doesn’t make its identity in the green or floral or fruity notes in its heart. What moves Bergamoss to a different level for me is how seamlessly it’s woven. It’s an old fashioned fragrance that values quality materials and careful craftsmanship over pandering fashion, and I adore that. An important note: Bergamoss is only offered as a solid. This means it’s a quieter fragrance than many. It also fades by midday. If you equate longevity and sillage with value, you’ll be disappointed. I understand. I’m afraid I’d run through a quarter ounce in a month or two if I had some in my purse. So, budget beware. 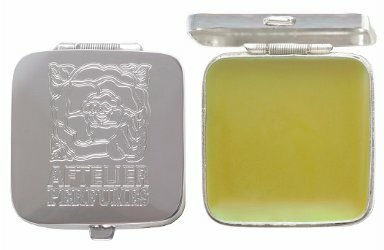 Aftelier Bergamoss is $240 for 8 ml of solid perfume in a sterling silver, refillable compact. A sample is $6. For information on where to buy it, see Aftelier under Perfume Houses. Update: in late 2015 Bergamoss was issued in a limited edition 9 ml Eau de Parfum, $60. Wow – sounds just so gorgeous! I am lucky to have a small decant of the original Coty Chypre. I horde it when I should really wear it up. I wish this wasn’t so costly, but you get what you pay for right? Swooning! It’s definitely a luxury buy, and I don’t see any in my future, either. I love my sample, though! Love bergamot and moss – need to try this! The sample is really reasonable! I have a feeling I could run through one of the solids every 6 weeks or so if I kept one in my purse. I understand exactly how you feel–I feel the same. I love smelling it and wearing it, but for my tight writer’s budget, I don’t see it happening. Yes, the price makes places this out of reach. Such a shame because it sounds like a great beauty. Thanks for letting us experience it in words! Oh, yes, sample away and let us know your opinions! I haven’t sprung for any of her stuff yet, but know that is just a matter of time. I have liked so many of Mandy Aftel’s perfumes that I will have to try this, even though I’m still a novice when it comes to appreciating chypres. Like hajusuuri, I can’t buy just one sample so I’ll be getting a few others too! I can recommend the body oils, if you’re in the market for something like that. They’re luxurious and affordable. I made short work of a bottle of the chocolate saffron oil and want to try the frankincense oil next. Oh, great suggestion. I have the one with coffee and fir and pear–so unusual!–and might have to try some of the others! That was the other one I was thinking of trying! As you say, it’s so unusual. Another beautiful review, thanks Angela! The antique civet, is that oil from an actual civet? A cache of it had been found somewhere, or something? My guess is that it is. I know Aftel buys antique materials from all over. Interesting, I wonder if it antique civet is worth a lot? I believe it’s legal to take civet oils from civets these days unlike, ivory for example. It looks like Mandy answered your question below! Thank you so much Angela for this amazing review of my Bergamoss solid perfume! I am so appreciative of your kind attention and thoughtful writing, and grateful that you mentioned the cost and longevity and sillage. I would hate for someone to buy one of my solid perfumes and not know that and be disappointed. Because the solid perfumes come in an antique or sterling silver case, when you buy one the first time with the case it is quite expensive. Then once you have one of our cases the refills of any of my perfumes cost much less — I love to see the cases come back to me well-loved and ready to be cleaned, polished, and refilled. The antique civet I have is something I bought over twenty years ago from an old retired perfumer’s collection of essences. I have also gotten samples of what is reputed to be sustainable civet from Thailand. Thanks again to you, and special thanks to Robin, and thanks everyone for their nice comments — I will check back later to see if anyone has more questions for me. Thanks, Mandy, for checking in!